When Mary Lou Strande started at the Paynesville Medical Clinic back in January 1957, her job duties included working the front desk, doing laboratory tests, assisting the physicians, doing some x-ray, keeping business records, and doing whatever else needed to be done. 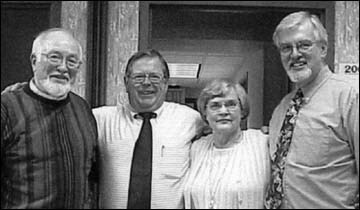 Pictured with Mary Lou are Dr. Ray Lindeman; William LaCroix, PAHCS administrator; and Dr. Allan Solum, current PAHCS doctor. Strande, who is originally from a farm between Belgrade and Brooten, had just completed her training at the Minnesota School of Laboratory Technique in Minneapolis when she accepted employment at the Paynesville clinic, which at that time featured Dr. Clifford Myre and Dr. Ray Lindeman. A few months later, Dr. Ernie Aulick began practice with the clinic as well. Throughout her career, she worked with 15 doctors. She didn't know then that she would work at the clinic for 43 years. She credits that longevity to the pleasant working conditions, her co-workers, and the Paynesville community. Those were the days before technology transformed health care into what it is today. When she first started, Strande would use a microscope to count white blood cells manually in a blood sample. Other lab tests were like chemistry experiments with heating, cooling, etc. Strande said it was "pretty much like working in a chemistry lab only you were working with human blood and urine specimens." The advances in technology have allowed doctors to narrow the possibilities of diagnosis more quickly, yielding faster diagnosis. "You have a lot more things at your fingertips to rule out or give you a definite answer," she said of the current level of technology in health care. Organization of health care has changed on a dramatic level similar to technology. When Strande started, she would greet patients at the desk, do their tests, assist the physician in treatment, and do administrative tasks in her free time. Dr. Lindeman, who retired six years ago, described Strande as loyal, faithful, and dedicated. "She's lefthanded," he said, "but I called her my right arm." Her peaceful, unflappable demeanor had a modulating affect in the clinic, he continued. She was good at handling impatient patients at the front desk, a job that hasn't gotten any easier over the years. Lindeman said Strande was better on the telephone that anyone he knew in 45 years of practicing medicine. Strande always kept an even keel emotionally, according to Lindeman, and she helped foster an espirit de corps at the clinic. By the mid-1980s, health care had changed and so had Strande's duties. Since she started, she had done the accounts payable, the payroll, and the ordering. She moved to full-time administration around 1985. By then, the patient volume put more demands on administration, requiring more time. So she lost much of the mix of her duties and concentrated on administration. Ten years later, the Paynesville Medical Clinic merged with the Paynesville Area Health Care System, and Strande had to adjust to working for a public entity rather than a private clinic. Since then, her duties have become more focused. She did some purchasing for the Paynesville Area Medical ClinicÐas the new incarnation was calledÐalong with other adminis-trative tasks. Her specialty became coding, a task that wasn't even around when she started back in 1957. Coding involves assigning the proper numeric code to a diagnosis and a specific numeric code to the service provided. The two must correlate. "As things grow and advance, you have to zero in on one area," Strande said. "There's no way that you're going to be knowledgeable in all areas." In her retirement, she's looking forward to trading those thick coding manuals for her gardening magazines. She also does needlework and knitting, likes to bird watch, plans to remodel her house, and belongs to Paynesville Lutheran Church, where she hopes to have more time this year to help with the flower garden. "I enjoyed work. It was a rarity to feel I didn't want to go to work," she said. "I had some really nice people to work with over the years." "But," she added, "there comes a time when someone new needs to step in."